We already have the first semi-final between Portugal and Wales took place yesterday, and Portugal beat Wales by 2-0 in regular time to go through to the finals. This match is going to be fascinating as both teams are very strong and can win this game. 08th July 2016 at 00:30 (IST). They also played against the hosts in semi-finals of that tournament and thrashed them by 7-1, they have won six times out of the seven times they have met the host nation in a major tournament, so France has to be very careful. Their style of play is very simple, dominate the possession and in doing so, they wear out the opponent and their will to score. They have had the most amount of passes in the tournament so far with 3383 passes and completing 3064 out of it with a rate of 91%. They have had an average possession of 66% which tells us that how much of the ball they control. Their defense is very strong, and that is one of their strengths. Talking about the France, they have been very strong as well in their games in both attack and defense. Their players have shown what real quality means with the likes of Antoine Griezmann and Dimitri Payet who have scored whenever it was needed by them. Playing against Germany will never be easy because they style to dominate possession and if France can control that, not give them what they want they can go on to the finals. France has an excellent attack, and they should use it to the best if they want to win against Germany. Being the host nation is tough as expectations are too high but I think France has done an excellent job on that and have the correct attitude to win at this stage of the tournament. Neuer, Boateng, Hector, Howedes, Hummels, Schweinsteiger, Ozil, Kroos, Khedira, Gomez, Muller. Llorsis, Sagna, Rami, Koscielny, Evra, Kante, Matuidi, Pogba, Payet, Greizmann, Giroud. Germany is very robust and tough to beat, and I think they will have the upper hand in this game. GER vs FRA Euro 2016 semifinal match will start at 9 p.m. local time (12:30 p.m. IST). Singapore: TV: Eleven Singapore, ABS-CBN, and Singtel. 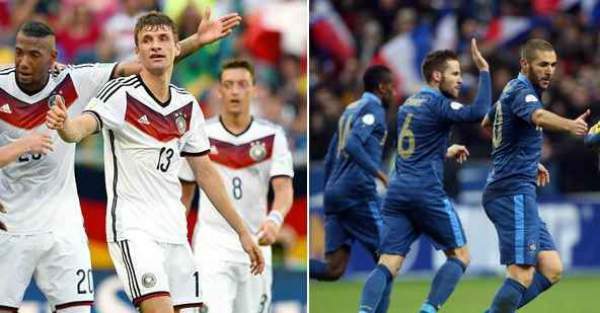 Germany vs France Live Score Live Stream: Singtel Go. Come back for the match result, full video highlights, commentary, live blog, and much more. Stay tuned to The Reporter Times for latest Euro 2016 news and other sports updates. Don’t forget to share it on social media sites so that others can also watch it. In the meantime, who do you think should win the game and reach the 2016 euro final? Feel free to add your views and thoughts via commenting below and check what others have shared.